Fly to another state to visit your siblings after your quarterly discovery that there is dust all over the luggage you keep under the bed. After having a lovely dinner with friends, go home with the book they lent you: Potty Training without Tantrums by John Rosemond. Discover chapter 8 (or is it 5? ), which deals with interventions for children who are more than old enough to correctly use the little ladies and little men’s rooms. This applies to your situations. Casually leave the book out. Decide to embark on said intervention during a long weekend since the preschool will be closed. The day before departure on said journey, borrow another baby gate. You will use gates, on the advice of said expert author, to gate both kids into separate bathrooms until they produce. Also that evening, draft a Potty Flow Chart with the plan for this journey (see below for an early example of ours). No pun intended. Realize that you need to get the 3 year old out of the crib since he can’t be a responsible pre-schooler who uses the potty if he is trapped in a crib during nap and bedtime. The next morning (D Day! ), note that the crib has a large/wide drawer that is the perfect size for under the bed storage in your room. Disassemble the crib and bring it – all but the wonderful drawer! – to the garage while your children alternately fuss and get real quiet in their respective bathrooms. Proceed with the day according to the Potty Flow Chart. Clean out the dusty drawer instead of setting the table for dinner. *** If this goes according to plan, the child that is upstairs has been crying pitifully for 28 full minutes at the top of the steps****. You are resolved, thanks to Dr. Rosemond, to see this through and let the kids take care of their own potty needs and clean up, thank you very much. Take a second as you walk to the bottom of the steps to re-resolve. Head up the steps with the drawer that is twice your size. Open the gate while managing not to fall down the steps. Avoid hurting the child with the gate as it opens (he/she is a mere 2.3 inches away). Achieve the last step up, realizing that the texture is not that of an old wood floor. It is pee. Get the dumb drawer over the pee puddle while telling said child to clean up after him/herself, for goodness sake. Also try to avoid whacking your child with the drawer as you swing it around to the other part of the hallway. Rejoice! There’s no pee on your new storage phenomenon, and the child is unharmed! The 2nd morning of the Great Potty Intervention, cry as you put the kids back in Potty Prison. Go to the office to online shop, because you have realized in the last 24 hours that a drawer, even a large one, doth not prevent dust under the bed. You need a dust ruffle. You have a Bed Bath and Beyond coupon. Realize that your box spring, upon which the dust ruffle will be placed, is low profile. Not standard. You don’t know what size dust ruffle you need, and in order to find out you have to measure, and in order to do that you have to walk past 1 of the bathrooms. You are not willing to show your face to a child who you have imprisoned. This is not due to guilt. You are merely following the advice of the good doctor to not intervene. The child makes his/her own poop. Resolve to measure for a dust ruffle just as soon as you can without compromising potty prison time. Since you are in Office Prison, write a blog post detailing these steps for the benefit of humanity. *Editor’s note: steps 1 and 2 can be interchanged. **You are a mere 17 steps away from maximizing under the bed storage while keeping it dust free under there. ***An entire day has gone by. Both kids are still in their respective bathrooms. ****Editor’s note: ***is incorrect. One child is 2 feet outside the bathroom at the top of the steps currently. *****Somehow, you are back on the steps at this point, behind the gate, behind the pee puddle and sobbing child. Somehow the kids has a rag and cleaning up through tears. The drawer is a mere 4 feet away, but feels like an ocean’s distance. It’s just like Jane Eyre described to Mr. Rochester the night he proposed. “Your wife stands between us.” Or something like that. You don’t remember the exact quote. You haven’t read a real book since college – only the pertinent parts of Potty Training without Tantrums. Heck, you had to search the entire internet for ‘Jane Eyre characters’ in order to remember Mr. Rochester’s name. Hat tip to Jen Hatmaker’s style of How To lists. This beautiful poem from a dear grandma lady, who is in our community, arrived in the mail today. I called Karen Beltz to thank her, and to ask if I could post it here. She wrote it for me. I just know that it’s for all of us. Read it and enjoy. (I believe if you click on it, you can then zoom in to see better each page). I, for one, am still digesting it. I think I will read it every day. Mercy is Blue, a 3 word poem that came to mind as I tiptoed through the garden hose to turn on the water to clean off the rocks that we got at the construction site nearby. “Mercy” has pride of place in our kitchen, where I wrote the word during Lent during potty training, which we still have not completed. I guess mercy, too, is never finished. Blue mercy is especially important since it is Josh’s all time and only favorite color for all time, and big sister has finally admitted that it is her “best” as well. Mercy is so personal. Mercy me, I often teared up several years back, every time I thought of my own mother. I think, now that I know that mercy is blue, that I was blue, remembering her mercy. To me. Here they are, playing on the teeter totter with one of the rocks. Which, considering it is only a mere rock, is an act if mercy, yes?! Ok, I admit, that’s stretching our definition a little far. 😉 I do it for the sake of the unity of this random post. But the rock isn’t blue. And neither are you, I hope! Happy end of summer and beginning of fall, friends! Dear friends, it’s been awhile! My three little whirlwinds have been keeping me busy, and also we moved a couple months ago. I keep thinking it will calm down enough that I will start blogging again, but it hasn’t happened yet. However, I’ve been admiring other people’s Seven Quick Takes (7QT) posts for years now, so I thought I would throw together one of my own. No theme to this post except … “seven things I’ve taken photos of over the past month or so.” Enjoy! ONE: Our little runner, dancer, climber Rachel has finally had her first serious fall – from a patio chair headfirst onto the stone patio. Ouch! She cried pretty hard, but it was nothing that a nursing session and some Tylenol could not solve. On the left is Rachel on the day of the fall, maybe an hour later. Pretty bruised-up but happy as a clam! On the right is a photo of the black eye that she still had more than a week later! For the record, at this age, big sister Elizabeth was not climbing – she was not even walking yet. TWO: I ran a race! It wasn’t my fastest 5K, by a long shot, but it was far from my slowest either. It wasn’t a great run, but I did my best to enjoy the gorgeous course, all along the St. Joe river in Mishawaka. 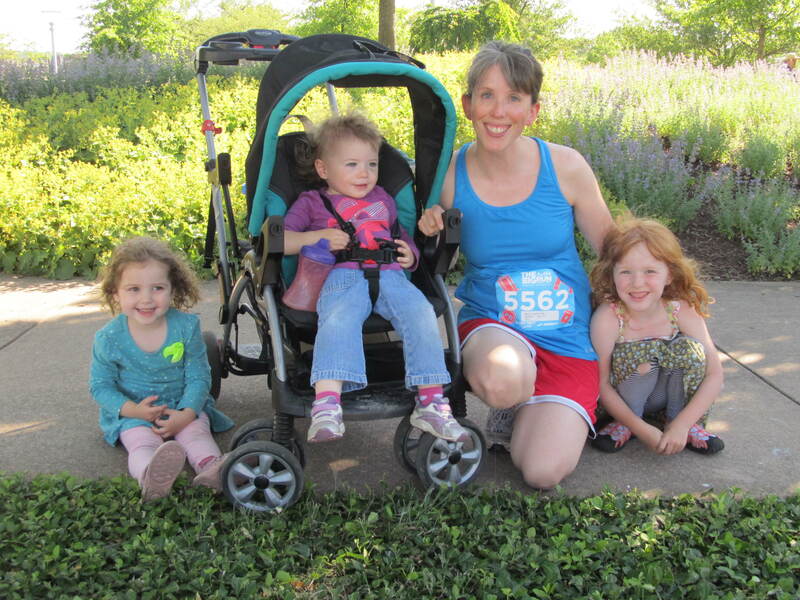 Absolutely the best part of the race was my kids. Pete brought them along and they (1) had a ton of fun playing around the little waterfalls in Buetter Park, (2) gave me a boost during my third mile when I felt like dying, and (3) spent the whole ride home talking about when they would be able to run races. Be still my heart! FOUR: South Bend recently had a flurry of fun events happening for the “Best Week Ever.” We were really excited about one event in particular involving bubble-blowing and chamber music, and I was devastated when we got there and realized it had ended early. If I had been on my own, I would have pursued this excellent course of action: drag my kids around the Century Center looking for someone who could explain why the event had ended early. Impress upon them how unhappy we were about the event having ended early. Go home feeling miserable about having missed the event and beating myself up for not having gone earlier. Instead, thank you Lord, I have an awesome husband who handles such situations much better. We walked across the river (as I silently grumbled about how hot it was and how I hadn’t planned to take a big walk with the kids so they didn’t have good shoes on and I hadn’t packed enough water), made our way through a mediocre craft fair, and then found our children transfixed by the East Race. We got to see a number of people tubing or kayaking down the river, including one little boat that capsized (no injuries, thank goodness), and our girls never wanted to leave. They went home entirely happy, and by the grace of God (and the smarts of my husband) I was pretty happy too. FIVE: One of the great blessings of life at our new house is that our across-the-street neighbors are now next-door neighbors. You wouldn’t think it would make that much difference, but our kids are 5, 3, and 1, and theirs are 4 and 2, and pretty much none of them can/should cross the street solo. What they can do is see each other every time they are playing outside, and ask to play together, and most of the time we say yes. The girls love Gabe and Silas (“Gaaaaae! Siya!” Rachel calls whenever we see them) and it’s been awesome to have built-in playmates right next door. SIX: The Sunburst 10K, half-marathon, and marathon passed directly outside of our house this year. Pete ran the 10K, and the girls and I had an awesome morning cheering on the runners. We blasted Bruce Springsteen’s “Born to Run” on repeat through the morning (and somehow I actually never got tired of it), we set up the sprinkler for overheated runners to run through, and we clapped and cheered and blew bubbles as the crowd ran by. We got a little tired & sunburned by the end of the morning, but it was worth it. SEVEN: Another highlight of our new home is our sunroom, which has a gorgeous view of the sunrise in the mornings. One morning Maggie sat at our little kid table next to the windows to enjoy the sunshine with her favorite bear. The view of Maggie was even better than the view of the sunrise. Thanks for reading my first 7QT! There’s a lot more out there if you want to keep reading. Happy Friday! Hello busy mamas! I’ve started a YouTube playlist of excellent Good Friday songs. Particularly Thief by Third Day. I play on listening to this today in the midst of our hustle and bustle. I’ve always found that something like this helps to preserve the solemnity of this particular day. Also, tomorrow, I’m looking forward to meditating on the Holy Saturday sermon that I posted last year. Have a blessed remainder of this Holy Week. We are potty training our 4 year old, and I want to share about it, being careful to stick to the mothering side of it, and to speak well of her. She could be reading this in a couple of years! Dedicating time to this is of course essential. I had to decide to be willing to sit with her for up to an hour at a time, reading, singing, waiting, encouraging, etc. 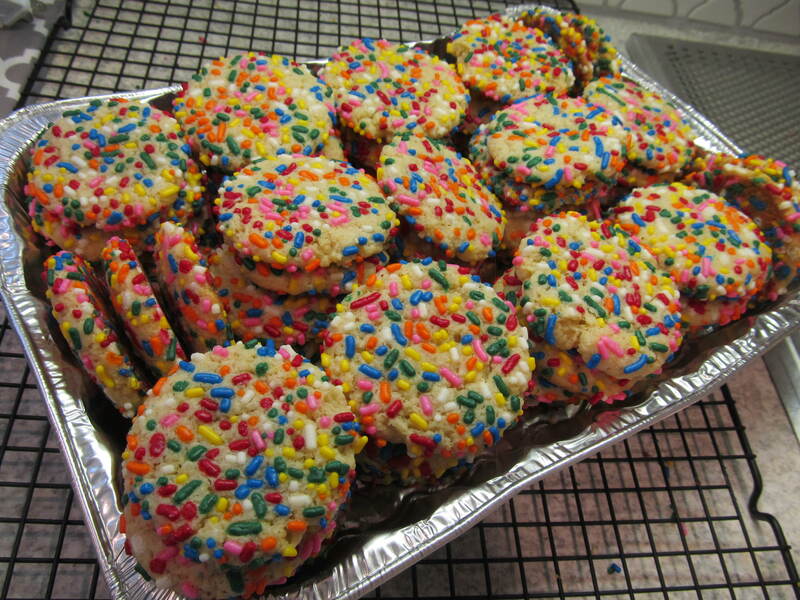 This is my Lenten penance. And I keep telling myself that it isn’t petty or choosing the “easy”, “obvious” thing. Choosing love in ordinary circumstances is harder, for me, than choosing some heroic deprivation that isn’t related to my friends and relations. The Holy Spirit is awesome on the subject of potty training. For instance, I prayed/yelped out to the Lord several weeks ago: ‘I have NO IDEA what to do! The date to start is coming and I’m FREAKING out!!! This will be the hardest child to train IN THE HISTORY OF THE UNIVERSE!’ And, behold, The One Day Method popped into my mind. From the little I had heard, I suddenly realized that it would be perfect for the personality of our daughter. More planning/prep for me, but perfect. I didn’t think of it until I prayed, and I wouldn’t have had the confidence to choose it (procrastinator that I am), if it hadn’t been presented through prayer. Day 3, I penciled in a visit to friends if ‘things were going well’. The day before, I sent that mama a text saying we were good to go. Day of, that didn’t seem to be the case (I’ll spare you the details), but, again, I thought it had been an inspiration of the Holy Spirit the day before to decide to go, so after waffling for 3 hours that morning, I went ahead and got us out the door. It turned out to be helpful to my social butterfly, even though getting out of the house on day 3 does not strictly follow the method. Gotta run. Pray for us, as we are praying for you! In my last post, I mentioned I’d found a new parenting book that was immediately effective for me. Honestly, it’s been so helpful that I feel like the Holy Spirit put it right in front of me so I couldn’t miss it – so of course I have to share it with you here. 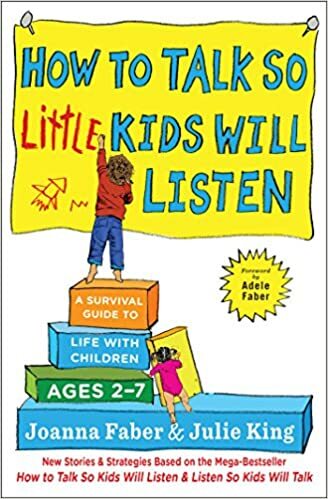 How to Talk So Little Kids Will Listen is written by the daughters of the women who wrote the parenting classic How to Talk So Kids Will Listen and Listen So Kids Will Talk. I skimmed that older book a few years ago, and didn’t find it helpful for my kids at that time; but this new book has been stunningly relevant and effective for me. Before I was halfway finished reading my library copy, I ordered a paperback from Amazon because I knew I would be consulting it over and over for years to come. I’m not going to write an entire book review here, but I wanted to share a few quick stories. First, in their discussion of rewards and punishments, the authors suggest using rewards for your kids in the same way you use them for yourself. You promise yourself a piece of chocolate after doing the dishes, or a few minutes of leisure reading after evening chores, as something to look forward to. It’s less of a bribe and more truly a reward. I’ve also used playfulness in a few different ways to get the girls up the stairs at bedtime. In the past I’ve tried “Who can get upstairs the fastest” games, with only modest success, but recently I modified it to “First one up the stairs gets the first five hugs! Second one up the stairs gets … the second five hugs!” Worked like a charm. Then last night when only the two-year-old was refusing to go upstairs, I paused and pretended to listen. “Wait. Do you hear that? It’s your bedtime bunny. I think he’s crying! We’d better go check on him.” She scampered upstairs without a second thought. Well, the baby is crying so I’d better go. But you don’t need any more description from me anyway. Go to the library or go to Amazon. Get the book, read it, try it, then come back and tell us all YOUR stories! A few weeks ago I was surprisingly encouraged by an article that told me to stop whining. Although the headline is a little overdone and the author is, I think, overly harsh toward her fellow mothers, I thought her diagnosis of modern motherhood was spot-on. First, she pointed out that we’ve managed to make motherhood “simultaneously insignificant but also impossibly hard.” YES! And then she went on to say, basically, it is hard work that we don’t know how to do well; so it seems impossible; so we give up. They do not know how to get their toddler to come when called. Therefore, toddlers aren’t controllable. They do not know how to stay caught up with the laundry and the grocery shopping. Therefore, the life of a mom is inherently a crazy cycle of unfair drudgery. They have tried—perhaps tried hard—and given up. They have decided that, like labor and delivery, all of motherhood is something to be waited out. …have I been? Well, so distracted that I don’t remember if I told you all that I have started working outside the home. And by “working”, I mean 4-7 hours per week. Sound do-able? I thought so too! I mean, that’s really not a lot of time. It was a fascinating and strange process to discern whether to do this. The job is for Marriage in Christ, which I can’t recommend highly enough. Attend a seminar! We did one 3 years ago, and the fruit just goes on and on. For instance, I have [nearly] ceased [almost] all of my Erik Improvement Projects. If you have ever thought that you knew what your husband should be doing or should be like, you know what I mean. It is slow and subtle personal poison. Priorities: God comes first, our spouse second, kids third, and then everything else comes after that. So, what’s a gal to do when a job is for God? Does that make it a #4 or a #1 priority?! In fact, even if you are not working directly for a religion-based program/church…isn’t everything we do missional? Isn’t “missional” a word? Spell check is yelling at me right now. Even at only 5 hours a week, and even if I do most of it while they nap, I still feel divided. My attention is divided. The kids are affected by this. “the witching hour”. Anyone with young kids knows what I mean. ], I was helping my daughter tape something, but all I could think about was washing lettuce for dinner. When I finally headed into the kitchen I just HAD to call our babysitter’s mother first to set something up for Monday. She happened to ring me at that second, and we talked about Monday and 2 other things (by the way, about Monday I had to call her TWO more times to clarify because I was so distracted by unwashed lettuce the first time), and all the sudden I look down, and one of the kids is whining loudly and hitting me. For how long had they been hitting me? For how long had they been whining? In what other occupation can a person be abused, and not even notice it? The end, and God bless you!